Never at any point in history has a buyer of HR and Payroll solutions had this level of insight pertaining to a vendor and their offering. 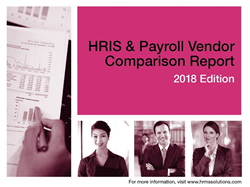 The 2018 HRIS & Payroll Vendor Comparison Report by HRMS Solutions, 7th Edition is the latest side-by-side comparison of leading HRIS and Payroll applications available today (http://www.hrmssolutions.com/resources/report-and-guides). Our most recent report explores a broader view of solution offerings available to mid-market organizations (i.e. 100 – 5,000 employees) and has been expanded to include over 245 functional and technical components for the HR & Payroll applications represented in this comprehensive assessment. “Leveraging our decades of experience as HR technology advisory and implementation consulting professionals for the Human Capital Management (HCM) industry gives HRMS Solutions a unique perspective and insight into the ever-changing mid-market HR tech vendor landscape. I believe this year’s exclusive report is stronger and more thorough than it has ever been. With extensive evaluation criteria that encompasses core HR, payroll, time, talent management, compliance, reporting and analytics, mobile and many more capabilities, the report not only serves as a reliable source to assist with the vetting of HRIS and Payroll providers, but it also provides benefit brokers with a tool to support their clients with reliable information,” reflected Mike Maiorino, CEO of HRMS Solutions. Released in May of 2017, the Sierra-Cedar 2017–2018 HR Systems Survey White Paper, 20th Annual Edition reported that 38% of organizations plan to increase HR systems spending in 2017-2018. This and several other key research insights related to integration strategy, business intelligence and HR analytics, the emergence of intelligent systems, risk and security validates the significance of our HR & Payroll Vendor Comparison Report and the need to continually increase its depth of evaluation criteria for organizations in the mid-market who are researching potential vendors and plan to invest in HR and Payroll technology this year.